A child learns to appreciate Nana’s urban environs. Nana has a new apartment in the city, and her grandchild is excited but nervous about visiting. “I love my nana, / but I don’t love the city,” she tells readers. Accompanying art depicts how the city seems “busy” and “loud” and “filled with scary things.” Illustrating the last point, the picture shows the child small and scared against a graffitied wall while following Nana and looking back at a homeless man who is begging with a cup held before him. That night, Nana listens to her grandchild’s fears and promises a better day, but she also describes her love of the city. A facing wordless spread depicts Nana knitting into the night; careful readers may recognize the red yarn from a title-page vignette of two cats with a ball of yarn. The next day, she gifts her grandchild a knitted red cape (the same one depicted in jacket art). This acts as a security blanket or magical talisman of sorts to change the child’s perspective of the city. Even an encounter with the previously “scary” homeless person becomes an opportunity for kindness as Nana hands him not money, but food. 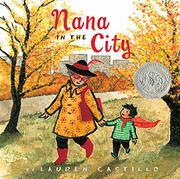 Throughout, Castillo’s soft, warmly colored art expresses the child’s changing feelings about the city while also depicting the characters’ close bond.